An Atlas of Virginia, second edition, was published by the Virginia Geographic Alliance in 2002. Produced by Laurence W. Carstensen, Robert W. Morrill, and Joseph D. Enedy of the Virginia Geographic Alliance, it was made possible by grants from the Virginia Geographic Alliance, the Virginia Department of Education, and the National Geographic Society. A CD accompanying print copies of the Atlas contained all maps, related lesson plans, and a collection of photographs. New versions of the atlas aligning with the new SOLs are in the planning stage for both first grade and Virginia Studies. Work has begun on online ArcGIS map packs and a curriculum workbook with 10-15 classroom activities of less than 30 minutes. Check the VGA website and facebook page for the latest information. The VGA has also produced a 8ft X 16ft floor map of Virginia. It emphasizes the physical features of the state. 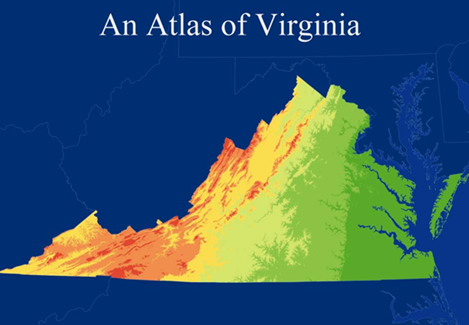 Note: A non-VGA produced digital atlas of Virginia is available from Virginia View at http://virginiaview.cnre.vt.edu/digital_atlas.html This work also has lesson plans attuned to the 2010 SOLs.